Darwin's first Christmas and it was great! She had a blast opening her presents (and some of ours). She would have been happy with wrapped cardboard boxes actually. It was a lot of fun and she had a very full day. Cuddling on the couch with dad is a perfect way for her to end her exciting day (so spoiled). Pictures to come later... I'm feeling too lazy to download them. We were trying to keep things clean and throw away wrapping as we opened, but at the end we thought it'd be funny to take all the paper out and let Darwin have a chance at complete chaos. Needless to say, she loved it. Tomorrow she get's dropped off for boarding at Daynakin Great Danes. They are local great dane breeders up north and though it's a trek to drop her off, I felt more comfortable knowing she would not be in a kennel and with people knowledgeable about the breed. We'll be on vacation so we'll see you in the new year! Merry Christmas to you all and have a happy new year!!! 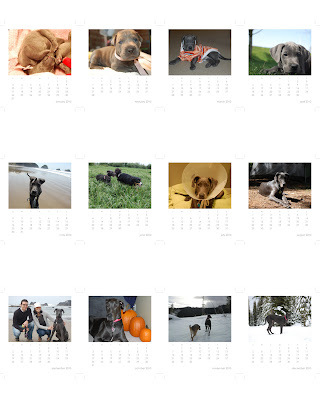 Since we got Darwin in February of this year, I decided to make a little 2010 desktop calendar documenting her first year... each month was represented by a picture of her taken in the month of 200, except for January of course, that was just a really early February picture. It's funny to see her growth over a 10 month period, especially since we fostered her from 5 days old, it's just something you don't usually get to experience. 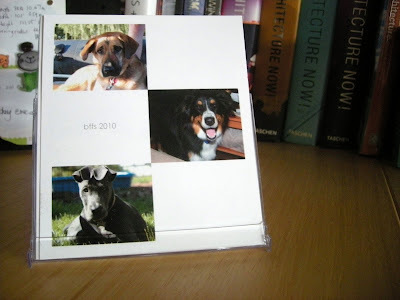 Here's what the bff one looks like on my desk! Darwin's prizes from the Wild Dingo contest came on Monday! She got a Planet Blue Dog Chase It skunk toy and Salmon treats! As soon as she saw the toy she wanted to play. There isn't enough room in the condo for her to actually chase the skunk and the weather outside wasn't really nice enough to play outside with it, so I took the skunk off the wand part and let Darwin play with it thinking she can get attached to the skunk so when we do play with it on the wand she'd be really into it. She loved the skunk. See that, that's skunk fuzz everywhere and skunk squeeker on the side. She managed to sever his tail and pull the squeeker out from there. Jason wasn't happy about the mess and promptly threw the skunk away (booo). But Darwin did get to enjoy one last part of him. Merry Christmas to all our blog friends! Jason was reluctant to let me share this picture, but I twisted his arm and here it is! I'm thinking Santa pictures for Darwin in the future won't have us in them. We're excited for our first Christmas with Darwin. She can't wait to get at all the presents under the tree, especially the gifts from Remi which she sneaks a sniff at daily. I'm surprised we haven't woken up yet with ripped open presents scattered about the living room and a happy Darwin curled up with new toys. A big thank you to Bess and Heffner for a new award! We love reading about all the things you do and all the crazy Christmas cheer your mom puts you through! We'll start with our first blogging buddy Moose who got us started! And Jack who always cracks us up with his stories. And Remi who we really hope we get to meet up for a playdate with soon! One of our newer friends Juno and Loki who'll be making a BIG move to Switzerland in the coming months. And finally to Shiloh and Chelsea some of our favorite Danes in Australia! So we took Darwin to daycare today, the second time for the week. Tuesday's report was that she was pretty much fine til the end of the day, then started getting anxious and stressed out when the other dogs started to leave. Today we pick her up and the girl sitting at the front said she was a lot better. Still a bit anxious at the end of the day, but doing better listening to commands. They had said before they would tell her to sit and she'd run away before coming back to sit. Today they had someone new in to interview, and she was told to sit and sat right away. Then a different girl brought Darwin out from the back and was asked us if Darwin listens well to commands. She said that Darwin hurt her running into her when she told her to sit and that since she's a bigger dog we need to work on that more. She said that Darwin has done that to multiple people. OI. Darwin. We know she's a big dog. We know that she gets very amped up when she goes to daycare. We know we need to get her to listen consistently when we give her a command. We've been working on doing short training sessions daily, even with the basic stuff. But how do we get her to listen to other people consistently? If they have a treat in their hand of course she'll listen, but when they don't she usually isn't interested. More training. In other news. A big THANK YOU to Remi! Darwin got a package in the mail today, and so we opened it when we got home. She could smell something really good in there and was excited to get in there! There were 2 wrapped packages as well as another bag of cookies and chicken! Darwin could not wait to get her mouth on the initial treat she smelled though. It took her a good 15 minutes, and it's gone already. haha. The other gifts are under the tree waiting til Christmas to be opened! Thank you Remi! Hopefully soon we'll get a playdate in! OH! 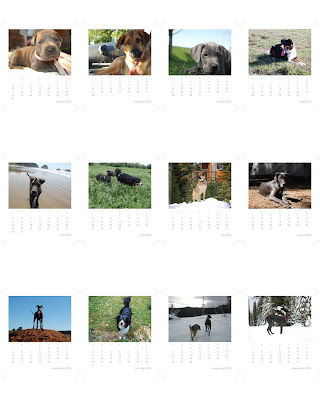 and a big woo hoo and thanks to Juno and Loki over at Wild Dingo. We were the winner of their contest for guessing they were moving to Switzerland! How exciting for them! And the most exciting part for Darwin, she won a pair of Juno Belle jodhpurs! I think she looks pretty good with jodhpurs. We all went for a long walk tonight. We practiced heeling and waiting and coming with Darwin. As much as Darwin doesn't listen, she's getting much better about walking on the leash. And she's been less of a scaredy cat and willing to walk farther than a block. We stopped in the pet store to pick up more training treats and Darwin managed to scare a little girl and make her jump about a foot in the air. We passed a lot of Christmas lights up and one house had a moving deer light statue. Darwin spotted it from the corner of the yard and stopped dead in her tracks. We made her walk closer to it and she just kept staring at it. Thank goodness she didn't bark at it, but my camera flashes made the lady who lived there come out to see what was going on. She thought it was hilarious that Darwin was afraid of it. After an hour walk Darwin is still ready to play! OMG. Who's bright idea was this movie?! and think "aww cute puppy movie." WRONG. Well technically it is, but OH jeez! If you haven't seen it yet, don't! Or go ahead if you have no heart. Most movies I'm willing to watch at least once... especially if I like them, I'll watch them over and over again. This one... goes on the short list of never watching again. Man. I don't think I've cried so much in a long time... ok at least a year and a half. *update: Many comments are about the lack of training for Marley, which I totally agree with. My whole thing of not wanting to watch it again was mainly cause it was so sad! I wonder if I would have found it as sad had I watched it a year ago, before Darwin was in the picture. I probably would have thought it was pretty sad, but not bawl my eyes out sad. For the folks who have read the book, is it worth it do you think to read it now, after I've seen the movie? Older merle female, who wasn't that into young Darwin trying to play with her. Dinky... his poor mom was peed on by some rotweiler. eww. This is only our second time to this park, but there were a ton of danes there! Darwin had a blast! Though she was a little cranky towards the end so we had to leave. 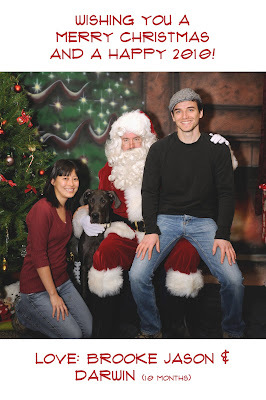 Today we took Darwin to get a Christmas picture with Santa Claws at the Seattle Animal Shelter. She was surprisingly well behaved, well, she was pretty excited by the other dogs around and being some place new, but she didn't bark at Santa and sat nicely for a photo. They are supposed to email us a copy so I'll post it later. I will say it's not as good as Bess and Heffner's but not bad for our first one. Then we took Darwin out to Marymoor for more play time. This poor dog was dressed in leopard print pj's and a coat. It was cold out, but I don't know if it was THAT cold! And on our loop around we ran into him again, and Darwin was chasing him and he ran straight into his mom and knocked her over. Poor thing. 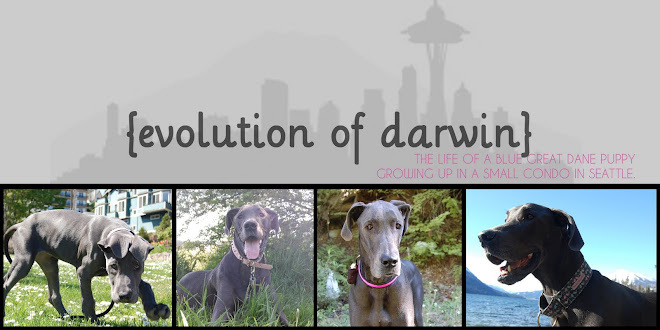 Here are some pictures of Darwin and Friday and their crush Marley before Darwin was a BAD girl. Hi, my name is Darwin and I'm a bad girl. My parents thought since I didn't have a play date today, that a night out at Jabu's would be a fun treat for me. We had a short play session down in the garage to get some craziness out of me and then walked there from home. Even though it was super cold out and I haven't been listening well, I did a really good job walking nicely to the bar even passing strangers and other dogs. When we got there I was pretty excited cause Robin and BB were there, and my bff, Friday. I was pretty crazy for a bit but soon I was calm enough to not be too obnoxious. After everyone else had eaten they decided to play games on this little table (Ms. Pacman, Jason's favorite). Then this handsome little 5 year old golden came in (off leash! )and Friday and I were in LOVE. He really looked like Maxdog of South Africa but I knew it couldn't be him since he lived so far away. The people working at the bar said Friday and I could be off leash with him as long as we were well behaved. Friday was the most playful I've ever seen her, and I was my usual goofy gal, trying to get his attention. He didn't pay much attention to either of us, but was happy to get pets from Mom and Robin. After a bit it was time for us to leave, and we didn't realize the door was left open, so as soon as Dad put my coat on I dashed outside to say bye to Friday before Mom or Dad got to put my leash on. Dad ran out after me and I thought we were playing chase so I ran across the street! Robin and BB and Dad and Mom were out there yelling at me to come and to stop and I was thinking "woo hoo! Look at me hiding on the opposite side of the street!" Dad ran over and soon BB and Mom were there too...Dad ran up to me so I ran towards Mom thinking I could out-manuever her to get away (as cars were coming from down the street), but I forgot Mom was smart and put the pinch collar on me before we left the house! Out smarted again (I'd shake a fist at her if I could)! Mom quickly grabbed me, and managed to grab just enough skin and collar to pinch and I yelped in pain and stopped in my tracks. She put my leash on me and her and Dad both scolded me, and though I don't know exactly what I did I knew I was in BIG trouble. Mom crossed the street to say bye to our friends, and shortly after Dad and I joined them. As we started walking home Mom said SHE wanted to hold my leash and I knew for sure a cute face wasn't going to get me out of this one. We walked home and I tried to be on my best behavior... walking at their side, no pulling and hardly any stopping to sniff around. No no, I know, when Mom gets this upset with me, I better watch out. After some snowshoeing and warming up by the fire, we decided to use the rest of our time sledding! Darwin wasn't sure what was going on, but had a lot of fun following people up the hill and running in front of them on the way down. After a fun sledding session it was time to load up the snowmobiles and sleds and head back to our cars. Friday once again was a breeze on the snowmobile, quite content to be there. Darwin on the other hand, not so much. She was better than her ride up, but still not willing to jump up on her own. After getting her settled it was time to head down and back to the real world. A fun filled weekend and something we'd be willing to do every year!